GH Services is an authorized Canadian dealer for Clef Revolution Solo and David Gage Realist acoustic upright bass pickups and transducers. Clef Revolution pickups are made in Connecticut, U.S.A. by Upton Bass Company. David Gage Realist pickups are made in New York, U.S.A. by David Gage. These pickups provide low-priced alternatives for upright bass amplification. GH Services is located in the Niagara Region of Canada, near Toronto and the Canada-U.S. border. Owner Greg Holmes is a long-time musician, ready and able to help you with any questions you have. More about GH Services here. 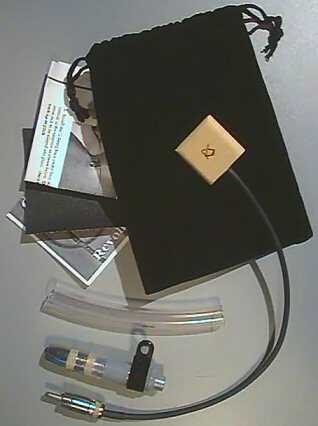 Clef Revolution Solo II pickup with accessories: carrying pouch, installation instructions, sandpaper, after-length damper, and RCA-to-1/4" adaptor. 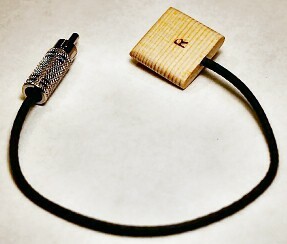 The Clef Revolution Solo II transducer piezo element is embedded in a piece of German spruce. It is installed by wedging it under one of the bridge wings. Most players prefer to install it on the bass side of the bridge with the "RS" facing upwards towards the strings, but different sounds can be achieved by mounting on either side of the bridge and orienting the sensor with either side facing upwards. 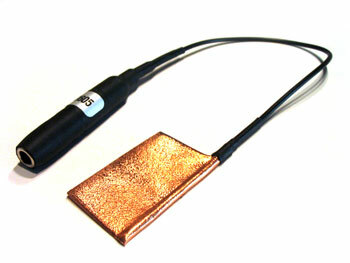 A new custom piezo, which is both more powerful and more efficient than what was previously used. The new custom piezo now has drastically lowered impedance, which will virtually eliminate the need for pre-amps as well as provide universal compatibility with most amplifiers on the market. The new piezo is also capable of a broader tonal range, while sub-harmonic frequencies have been significantly reduced. Upgraded parts to fully shielded, pro audio quality components. An optional after-length dampener that is simple to install within seconds. Some basses perform better amplified with some minor after-length dampening. The Revolution Solo II pickup comes with a male RCA-style connector attached to the pickup (as seen in the photo at right) and a separate RCA-to-1/4" adaptor. The idea is that the RCA-to-1/4" adaptor can be permanently mounted out of sight under your tail piece (using the provided bracket), and yet the pickup itself can be removed easily. This allows players to detach the visible elements of the pickup during acoustic orchestral performances, but easily re-install the pickup for amplified jazz gigs. This pickup has a high output level, and does not require a pre-amp. A new pickup comes approximately 7mm in thickness. Fitting it to your bridge can be accomplished by either sanding down the Revolution pickup (on the side without the "RS") and/or by increasing the space under your bridge wing. Take care to remove a little at a time, and check for a snug fit and a full tone after each adjustment. Complete instructions are included with each pickup. For a limited time, we have some of the original Revolution Solo pickups (pictured at right, with a single "R" imprinted on the surface) available at a reduced price. These pickups are a good choice if you're on a budget, but still want a very good pickup. The package includes a soft pouch, installation instructions, and RCA-to-1/4" adaptor. Note: If you make your Revolution Solo too thin during installation, you can return your pickup for a reasonably priced reconditioning service so you can try installing it again. But, due to the custom nature of the installation of this pickup, we cannot accept returns for full refund. If you are hesitant to perform your own installation, you could consider the David Gage Realist pickup, which generally requires no modifications to your bass. 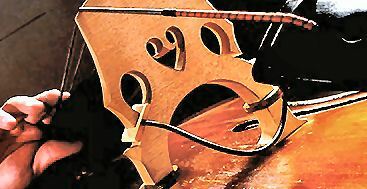 At last, a top-quality set of gut bass strings for the upright bass is available in Canada at a reasonable price! GH Services is the exclusive supplier of these strings in Canada. If you play bluegrass, rockabilly, or baroque music, you owe it to yourself to play on a true, full set of all gut strings. If you're a jazz player looking for that classic PC tone, then these strings are for you! Gut strings sets are unheard of under the US$200 mark and "handcrafted" sets can cost US$400 or more! We say "handcrafted", because in reality all gut strings are handcrafted. The mutton serosa (the material lining of the sheep's intestine used to make gut strings) is too delicate to process by machine. Even the twisting has to be done by hand by experienced craftsman to properly judge the correct tension. 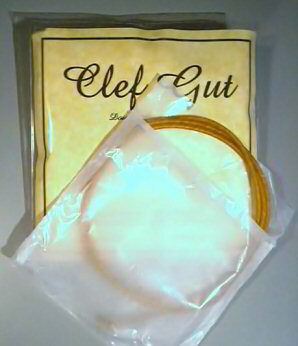 The Clef Gut strings are from a European craftsman using only mutton serosa. Mutton gives a lower tension, softer feel with warm rich tones. A high twist gives better tuning stability and better sustain (this is kind of a joke really as guts are known for having very low sustain). So far, they are available only in sets of 4 strings. Classic tone and stability - a high quality European-made gut bass string that will last. The Realist acoustic transducer was designed by Ned Steinberger in association with David Gage. A primary design goal was to create a transducer that would work equally well for pizzicato and arco through commonly used amplifiers, without requiring a pre-amp or other active, battery powered gear. The copper foil sandwich construction provides shielding to eliminate hum from light fixtures and other electrical or radio interference. The pickup is sandwiched under the bridge foot, usually on the bass side. The copper-clad element is flexible enough to conform to the curved top of your bass, so that the full pressure of the bridge can be concentrated evenly onto the piezo surface. Before installing, make sure your bridge foot contacts the top surface fully. The 1/4" output jack is mounted to the underside of the tailpiece. Some players have indicated that the Realist caused indentations in the top surface of the instrument. These indentations are usually visible under the lead wire that attaches along the side of the transducer. The indentations are only visible when the Realist is removed, and are usually only a concern because they fall outside of the area normally covered by the bridge foot. If you are worried about the possibility of indentations on your instrument, you could consider the Clef Revolution Solo pickup, which mounts into a bridge wing. These products are priced for Canadian customers, but special arrangements can be made for other countries. For Canadian sales, the price includes shipping and sales taxes (GST/HST for sales in Canada and PST for Ontario). On standard business days, we usually ship out within 24 hours of your order. Preferred payment methods are, in order: e-mail money transfer (INTERAC), bank wire transfer, certified cheque, money order, PayPal (+3%), Visa (+4%), MasterCard (+4%). Credit card payments for non-Canadian customers are in CA$ with exchange rates chosen by the credit card companies, resulting in minor variations from the prices given here. It is usually possible to use PayPal even if you don't have a PayPal account. Of course, the following comments must take into consideration the whole chain of elements, including the player and playing style, the instrument, and the amplification. I feel that these two pickups provide excellent low-cost alternatives, and are both worthy of your consideration.